Dudleya traskiae is an endangered species protected by California and Federal Law. It is illegal to collect or posess Dudleya traskeia plants that were collected in the wild. Dudleya traskeia is a native endemic to Santa Barbara Island, it lives no where else in the wild. Dudleya traskiae is in the nursery trade in both a green and white forms, white form shown here. The Santa Barbara Island Liveforever grows on rocky cliffs and rock outcrops. Primary exposures are to full sun locations with a south componet to their exposure. Dudleya traskiae occaisionally make it in north exposures on inland parts of the islands. Plants should be planted in a sunny well drained location near the coast. The Santa Barbara Island Liveforever should be given some mid-day shade for inland gardens. The rosette should be planted on an angle so that water will not collect, causing sunburn and rot. I like planting the Santa Barbara Island Liveforever into the face of a drylaid rock wall. 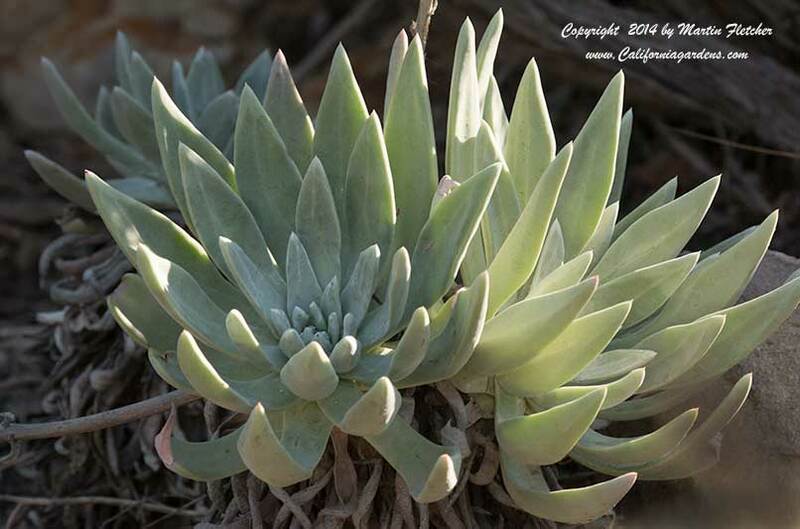 Dudleya traskeia will grow a rosette of leaves up to 2 feet across. Plants produce stalks of yellow flowers with red veins in the late Spring. Succullent rosettes of Dudleya traskiae - Santa Barbara Island Liveforever. High resolution photos are part of our garden image collection.